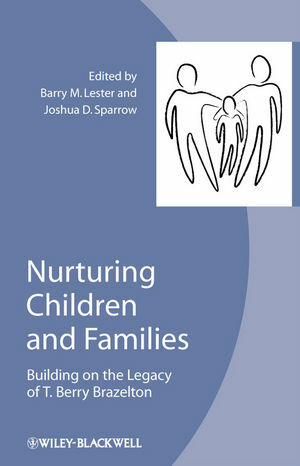 This volume celebrates the work and influence of T. Berry Brazelton, one of the world's foremost pediatricians, by bringing together contributions from researchers and clinicians whose own pioneering work has been inspired by Brazelton's foundations in the field of child development. Barry M. Lester, PhD is Professor of Psychiatry and Human Behavior, Professor of Pediatrics and founding Director of the Center for the Study of Children at Risk, Brown University Alpert Medical School and Women and Infants Hospital. His research has addressed processes of development in children at risk due to biological and social factors. His research has been continuously funded by the NIH for over 25 years. Dr. Lester was a member of the Council at the NIH National Institute on Drug Abuse. He directs the Infant and Child Mental Health Post-Baccalaureate Certificate Program at Brown University and is past President of the International Association for Infant Mental Health. He is the author of several hundred peer-reviewed publications and 16 books, including Why is My Baby Crying? Joshua D. Sparrow, MD is Director of Special Initiatives at the Brazelton Touchpoints Center, Children’s Hospital, Boston, and Assistant Professor in Psychiatry at the Harvard Medical School. He has co-authored eight books with Dr. T. Berry Brazelton, and revised with him the second edition of Touchpoints Birth to Three: Your Child’s Emotional and Behavioral Development. His work focuses on the social determinants of development and health, and culturally informed adaptations of interventions that catalyze community healing and self-strengthening processes. Introduction (Joshua Sparrow and Barry Lester). A Tribute to T. Berry Brazelton: Excerpted remarks from Pioneering Change Symposium, November 15, 2008, in honor of Dr. Brazelton's life's work (Geoffrey Canada). PART I: A SCIENTIFIC REVOLUTION IN BEHAVIORAL AND DEVELOPMENTAL RESEARCH. 1. Transforming the Research Landscape (Barry Lester). 2. Aligning Systems of Care with the Relational Imperative of Development: Building Community through Collaborative Consultation (Joshua Sparrow). Section II: Advances in Understanding Fetal and Newborn Behavior. 3. Before Infant Assessment: Fetal Neurobehavior (Amy L. Salisbury). 4. The Development of the NBAS -- A Turning Point in Understanding the Newborn (J. Kevin Nugent). 5. Keys to Developing Early Parent-Child Relationships (Kathryn E. Barnard). 6. Prenatal Depression Effects on Neurobehavioral Dysregulation (Tiffany Field). Section III: Self-Regulatory and Relational Processes. 7. A New Look at Parent-Infant Interaction: Infant Arousal Dynamics (Daniel N. Stern). 8. Infants and Mothers: Self- and Mutual Regulation and Meaning Making (Ed Tronick). Section IV: Regression and Reorganization in Relational Models of Development. 9. Patterns of Instability and Change: Observations on Regression Periods in Typically Developing Infants (Mikeal Heimann). 10. The 4 WHY'S of Age Linked Regression Periods in Infancy (Frans X. Plooij). Section V: Relational and Contextual Developmental Models. 11. An Ethical Framework for Educating Children with Special Needs and All Children (Stanley I. Greenspan). 12. Protective Environments in Africa and Elsewhere (Robert A. LeVine). Section VI: Neuroscience Perspectives on Relational and Developmental Models. 13. A Neurobiological Perspective of the Work of Berry Brazelton (Allan N. Schore). 14. Hidden Regulators within the Mother-Infant Interaction (Myron Hofer). 15. Temperament as Sets of Preparedness (Jerome Kagan). PART II: FROM THEORY TO PRACTICE: INNOVATIONS IN CLINICAL INTERVENTION. Section I: Preventive Interventions: Home Visitation. 16. Touchpoints in a Nurse Visiting Program (Kristie Brandt and J. Michael Murphy). 17. The Nurse Family Partnership: Honoring T. Berry Brazelton (David L. Olds). 18. Understanding the Preterm Infant (Heidelise Als). 19. Fueling Development by Enhancing Infant-Caregiver Relationships: Transformation in the Developmental Therapies (Rosemary Bigsby). Section III: Infant Mental Health and the Treatment of Early Trauma. 20. Infant Mental Health (Charles H. Zeanah and Paula Doyle Zeanah). 21. Ghosts and Angels in the Nursery: Conflict and Hope in Raising Babies (Alicia Lieberman and William Harris). 22. Understanding and Helping Traumatized Infants and Families (Joy D. Osofsky and Howard J. Osofsky). 23. Child Maltreatment: The Research Imperative and the Exportation of Results to Clinical Contexts (Dante Ciccheti and Sheree L. Toth). PART III: TRANSLATIONAL SCIENCE: IMPLICATIONS FOR PROFESSIONAL DEVELOPMENT, SYSTEMS OF CARE, AND POLICY. Section I: Changing Practice and Improving Care through Professional Development. 24. Developing the Infant Mental Health Workforce: Opportunities, Challenges and Strengths for Translating Research to Professional Development and Practice (Libby Zimmerman). 25. The Touchpoints Approach for Early Childhood Care and Education Providers (Jayne Singer and John Hornstein). 26. Early Innovations in Behavioral/Developmental Pediatric Fellowship Training -- A Fresh Approach to Medical Professional Development (Constance H. Keefer). Section II: Innovating Change in Service Delivery, Systems of Care, and Policy. 27. The Birth of Child Life: Creating a Child-Friendly Hospital Environment (Myra D. Fox). 28. Improving Healthcare Service Delivery Systems and Outcomes with Relationship-based Nursing Practices (Ann C. Stadtler, Julie C. Novak, Joshua Sparrow). 29. Translating the Science of Early Childhood Development into Policy and Practice (Daniel Pedersen and Jack P. Shonkoff). 30. Placing Relationships at the Core of Early Care and Education Programs (Francine Jacobs, Mallary I. Swartz, Jessica Dym Bartlett, M. Ann Easterbrooks). Section III: Changing Ways of Being. 31. Respect and Healing (Sara Lawrence-Lightfoot).